I bought the snowflake duvet to match the sheets I bought. It was used in a guest room during Christmas when my daughters and their families come to stay. I like to decorate for the holidays, and even bedding is used to bring out the winter holidays theme. 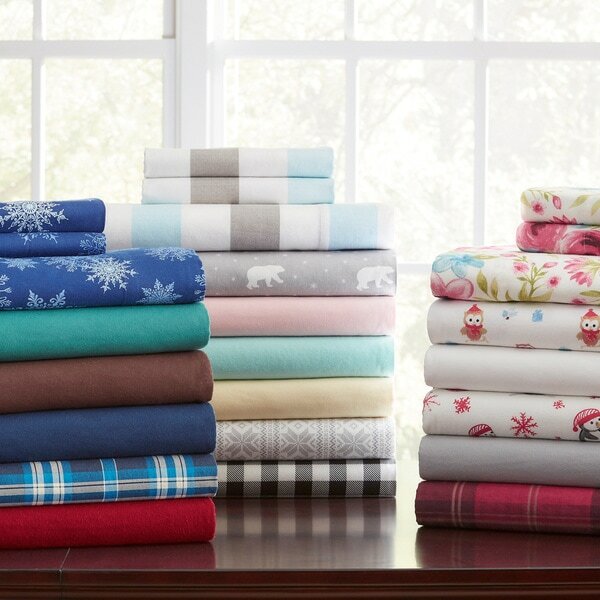 Stay warm while keeping your bed looking fun and stylish with this oversized duvet cover set. Made of soft 100-percent cotton flannel, this set is available in a variety of solid colors or playful, winter-themed patterns to best fit your personality and needs. THE COMFIEST DUVET COVER SET I HAVE EVER OWNED :-) This review is for the Flannel Pontehaven set with the Sylvan Rose Pattern: Vibrant & Bright Colors and exceptional quality & craftsmanship! I was a little hesitant after people stated that it was "oversized" but the King Duvet and shams fit our King Comforter perfectly! I have purchased 3 sets of this product: the ashby plaid, blue plaid and the sylvan with pink roses. All are FANTASTIC and only get softer and softer with each wash. Don't wait! Treat yourself because you will love these sheets :-) The flannel is thick so if you run hot then these may not be for you. Love the quality! Purchased the duvet cover In Savannah for my boy’s twin XL beds, beautiful and so neat, fit great! Definitely would recommend to anyone! The flannel oversized duvet cover set and the flannel sheet sets together are very fancy to look at. And I’m very impressed with the quality of the fabric. I’m glad overstock carries this good quality products. This duvet is very well made. It is soft fresh out of the box and just gets softer with washing and drying! I ordered the yellow and it is a lovely light butter color. These flannel sheets are indeed oversized and very cozy looking. It did take 2 weeks to get these ... but they eventually came (from ca) well packaged and sealed. They are exactly as described and I would recommend this duvet cover... if u want to feel cozy warm on those cold winter nights ... this duvet set will totally help you feel snuggly warm. I love this duvet cover set and so does my husband? Very warm and comfortable. Great set for cold weathers. this duvet cover is warm & thick enough flannel that it compares with the ones I purchased up in Victoria, B.C. and it is a better price. They was good and the pillow shams feel good to lay your head on. This is the softest and warmest duvet I own. I was looking for an oversized duvet that will fit my oversized comforter and this is perfect. It washed and dried lovely, no shrinkage or pilling. Highly recommend. This match the sheets that we bought and we gave them a 5 as well these are just wonderfully made lightweight flannel warm and as I said with my other review they grabbed hold of the bed and there's no slipping or sliding. So if you put using it as a duvet your duvet will be on the bed in the morning. That is saying a lot. Beautifully manufactured in packaged. I recommend. Cute won't hold up for forever. Just as described. Good quality. I highly recommend. Love these sheets! Bought the polar bears, so warm with them and my goose down comforter. Its soft and sized perfectly! Heavy flannel. Lots of pilling but, first washings can sometimes have this result, especially with dark colors. "On the red plaid fabric, are the colors yarn-dyed in or printed on?" "Do these have corner ties on the inside?" Yes, these duvet covers have corner ties. Because I had special size comforters queen 90x98 and you were the only one who had the size close to it reasonably priced. "In the picture, the shams look like pillow cases. Do they have a flange and button closure? Thank you!" The duvet set comes with the shams (1 sham in case of Twin) and it has 2” flange on all 4 sides and opening and flap on the back for the pillow.